You are here: Home / Appetizers & Snacks / Hot and Cheesy Crab Dip ~ The Perfect Party Dip! 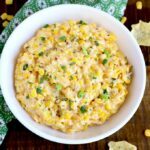 Hot and Cheesy Crab Dip ~ The Perfect Party Dip! 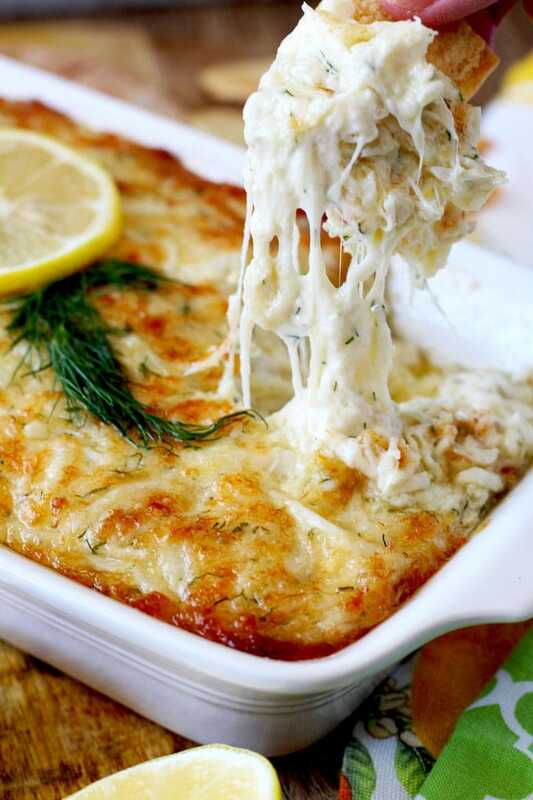 Lump crab meat, cheese, lemon and dill are baked to bubbly and gooey golden brown perfection. 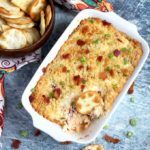 This Hot and Cheesy Crab Dip is scrumptious, rich, delicious and the ultimate party dip! 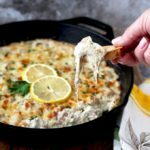 If you want to impress your family and friends with cheesy, gooey, melt in your mouth flavor, this Hot and Cheesy Crab Dip is the way to go!! 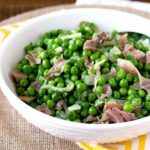 This easy to make appetizer is always a crowd pleaser! Many year ago, the hubs and I went on a romantic getaway to Hawaii. I say “romantic” because it sounds cool we didn’t take our son with us, (we only had one baby then). As much as we loved our time together, we missed our sonso much that we spent half the time wishing he was there and the other half calling him. One night for dinner, we went to a wonderful restaurant and had the most amazing crab pizza. It was different, it was creamy and extremely decadent but somehow the freshness of the crab meat came through in every bite. At the time , I was developing a menu for a restaurant and looking for inspiration everywhere! Hawaii was the perfect place for the job! At that moment, in that restaurant, I decided to recreate those flavors into a crab dip! After a few times recipe testing (yes it’s a hard job sometimes), this Hot and Cheesy Crab Dip was created. I wish I could say this is a skinny dip but – that would be the biggest lie! 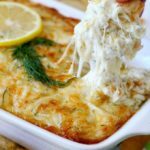 This hot and cheesy crab dip is scrumptious, rich, decadent, full bodied, extra creamy and crab meat lumpy! The lemon zest and dill add freshness and great flavor to the delicate crab meat. 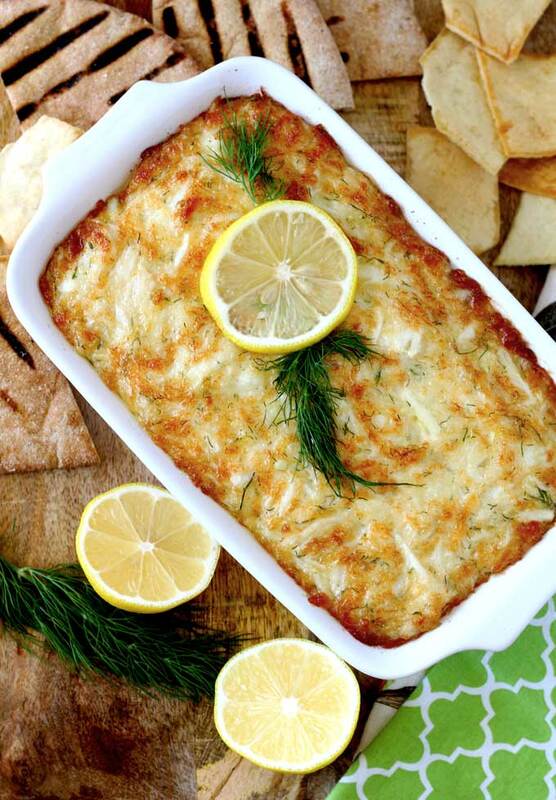 This Hot and Cheesy Crab Dip is as easy to make as it is flavorful. 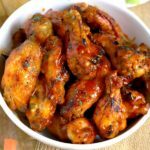 If you can mix a few ingredients together and put them in the oven – to heat and melt – then you are on your way to dip heaven! 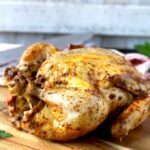 This recipe feeds a crowd. It’s a party dip after all! Feel free to cut the recipe in half. 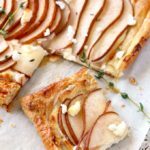 You can also make the whole recipe and bake just a portion of it. 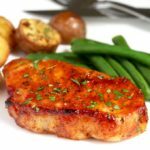 You can use the remaining mix to top salmon or cod. Mound the unbaked dip on top of the fish and bake. 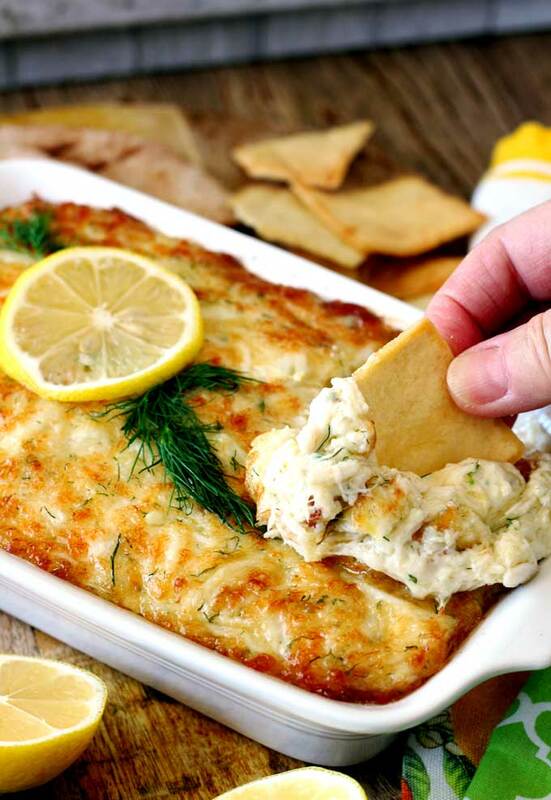 Serve this Hot and Cheesy Crab Dip with toasted pita bread, pita chips or sliced French bread. I would not use imitation crab meat for this dish. Fabulous Trio of Crostini the perfect dish for last minute entertaining! Queso Fundido Dip gooey, melty and delicious – with a surprise ingredient that takes it to the next level! 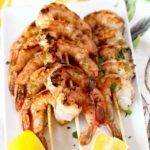 Hot and Creamy Shrimp Scampi Dip, the ultimate crowd pleaser! 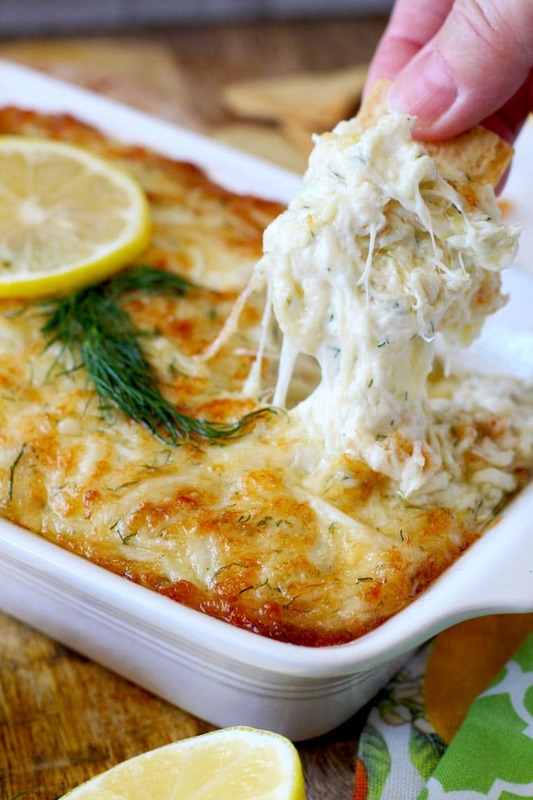 WANT TO TRY THIS HOT AND CHEESY CRAB DIP? In a medium saute pan over medium heat, melt the butter. Add the garlic, lemon zest and chopped dill. Saute for about 2- 3 minutes or until aromatic. You don't want to brown the garlic! Add the crab meat and mix well to combine. Remove from the heat and pour into a mixing bowl. Let the mixture cool for a few minutes. Add the mayonnaise and shredded cheese. Mix well to combine and season with ground pepper. Place the mixture into a baking dish and place in the oven. Bake for 15 minutes or until is bubbly and the top is golden. Garnish with lemon slices and dill if desire. Serve hot with pita chips or bread slices. Can you use imitation lump crab meat? Hi Donya, I wouldn’t. Imitation crab meat has a different texture and taste than the real crab meat. Sorry to bother you again but where would I find them in the store? I shop at Walmart would it be in cold case with seafood or in the isle with tuna? No bother at all! It would be by the cold case either in a can or sealed plastic tub. I usually get it at supermarkets, Costco or Trader Joe’s. I haven’t try Walmart yet but now I’m curious to see if they have it! I will check next time I’m in there. Also, check the canned isle area – I think canned crab meat (by the tuna) would be the next best option. Thank you and feel free to ask any questions!!! 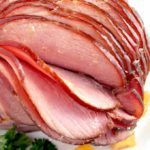 Hi again Kathy, I got everything I need and will be making it for Thanksgiving at my mother in-law’s (unless my hunny wants it for himself to snack at home lol) but I was wondering what size dish you used. Thank you for a delicious dish and you have a nice Thanksgiving and a Merry Christmas! Super cute PW set: http://amzn.to/2f1XNiZ Either size works. Just bake it until golden and bubbly!! Can you make ahead and bake the next day? Absolutely! Just keep it covered and refrigerated. Hello! Is there any substitute for the mayo? Hi Pia, I have not try it with anything but mayo. However, a combination of cream cheese and sour cream could work. What about using another kind of cheese. My family and I are not fans of swiss. We are not big fans of Swiss either but when cooked and melted; this dip doesn’t have a strong Swiss cheese flavor (at all). That being said, I think you can sub it with some Gruyere or Monterrey Jack. Let me know how it turs out! This was a big hit! Will make it again. Thank you. We made this dip and your pomegranate margaritas for a dinner party this weekend. I wish I made more. It was everyone’s favorite. Big success. So nice to hear!! Thank you! Made this for family thanksgiving. Everyone loved even the seafood skeptics. I didn’t change a thing. Easy. They are requesting it for Christmas, Thank You!!! Dear Barabara, thank you for the feedback! We love it too and love to hear what the readers think!! All the recipes are made and/or developed with much love! Thanks again. Hi Teresa!! Do you mean fully cooked/baked and then freeze it? I have not freeze these dips myself so I would hate to mislead you. However, I have freeze similar dips without any issues. That being said, crab meat is very delicate so I don’t think I would freeze that. Sorry I cannot be of more help. 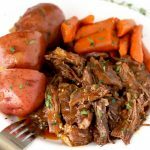 Do you think I can make this in the crock pot? And how long? 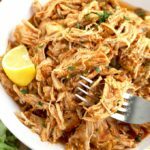 Yes this dip can be made in a slow cooker / crock pot. I would suggest cooking it on low for no longer than 2 hours. Stir it half way through the cooking process. Enjoy! !